Welcome back readers! 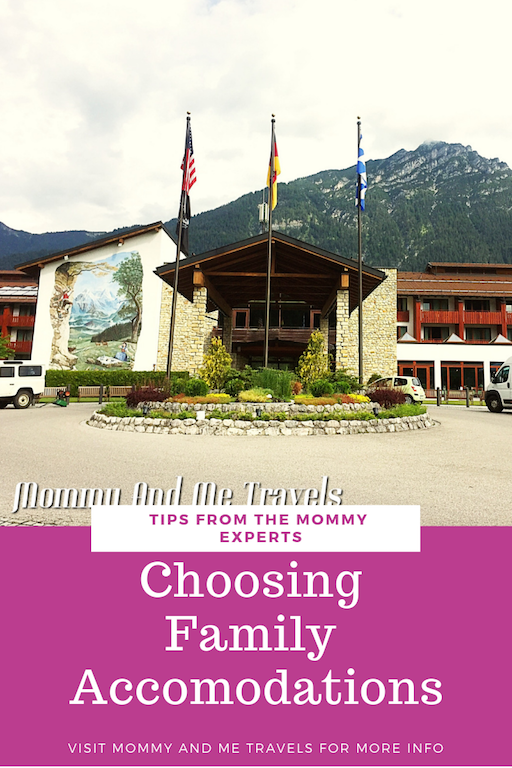 This week I’m excited to share with you the interview for the best ways on choosing family accommodations from our International Travel Mommy Experts. If you recall, these amazing family travel bloggers have been sharing with us tips and tricks for traveling will children. Quick recap: week 1 was inspirations on how to start planning your family vacation. In week 2 these family bloggers shared how to save money on transportation. That brings us to this week (3), Mommy And Me Travels is excited to bring you the interview about Choosing Family Accommodations: Tips from the Mommy Experts! Without further ado let’s jump in and here from our mommy’s. Mommy And Me Travels will kick it off with how I choose family accommodations when planning a trip! When choosing family accommodations for vacation I find the most important thing for us is cleanliness. While this seems like a given, we have found when traveling the USA and the World, the cheap places are not always the clean ones. I have young children that still enjoy playing on the floor and taking a bath. I cannot in good conscious let my kids do either of these activities if a place is dirty. This sometimes makes people refer to me as that person who has champaign taste on a beer budget. While this might be true, I find ways to make budget traveling work. I accomplish this by researching more and finding other creative ways to save money. Here are just a few ideas on things I do to save money and find the perfect sleeping arrangements. 2. If staying in a hotel: join rewards programs, look for places you can cook (with a kitchen) or has food provided (such as breakfast and/or evening receptions), sign up for their email alerts, and be flexible on dates such as traveling during the week. Here is a list of a few places I like to look for deals on hotels: Travelocity, Expedia, Booking.com, and Hotels.com. 3. Many sites are now available that let you stay in a house for a few nights to several months. You can find places such as houses that are only used for rentals and everything up to true house swapping. House swapping is where you and another family agree upon a length of time to switch houses. Depending on your requirements and level of comfort this could mean your accommodations only cost you pennies a night. Here is a list of places that I review when looking for houses: Airbnb.com and VRBO. Welcome, Kristy from World For A Girl, I hear that you only book accommodations with a kitchen. What tips can you share with us for finding these types of rooms? When it comes to choosing good family accommodation with kitchen facilities, we have two favourite routes. The first is using hotel booking platforms. We use the search functions to really narrow down the options. For example, if you use Booking.com on a PC you can use the search bar on the left to select only apartments or only places with swimming pools. On AirBnB.com, there is a similar search feature where you can search only for family-friendly properties (under the Trip Type tab) and select items that you require like cribs and high chairs (under the More Filters tab). Our second favourite way of finding exactly the right accommodation is home-swapping. We are huge house-swap fans having had successful swaps in Denmark, Switzerland, the USA and Jamaica. We swapped our 4 bedroom house in London with families and retired couples. Sometimes for just a week and twice for over a month. I can’t even begin to list all the benefits of house swaps here but they include cost (it’s totally free except a small fee to the organizing website), the opportunity to swap cars as part of the deal, child-friendly houses filled with toys, meeting locals and exploring lesser-visited parts of the world. If you’re open-minded and relaxed about sharing your home with strangers house-swapping really is a fantastic and unique way to see the world. Hi Sarah from Dandelion Seed, I understand you have food allergies in your family and also look for accommodations with a kitchen. What tips can you share on how you decide the best accommodations for your family? Annette from Tips From A Typical Mom, I’m always in awe when I see big families traveling together. Securing accommodations for 7 people can’t be easy, what is your secrets for ensuring an accommodation has everything you need? 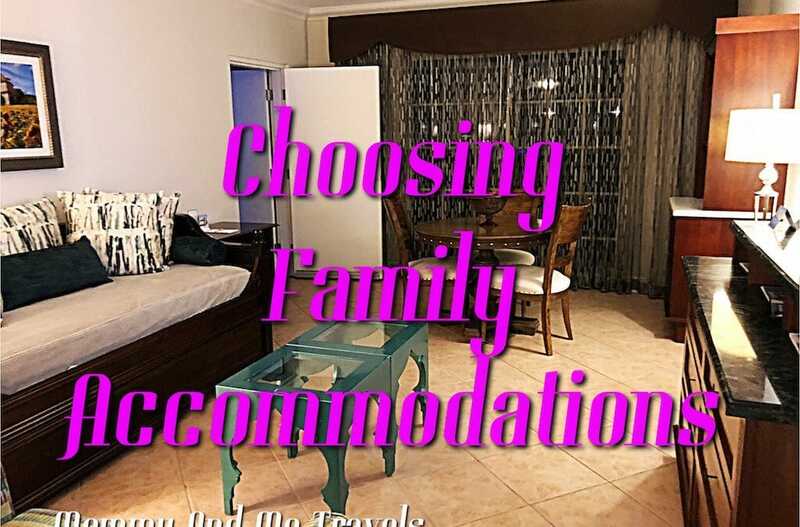 When it comes to choosing accommodations for my family, there is a checklist I like to use. This way I can be sure that we will be comfortable and have a chance to sit back and relax without stepping on each others toes. 1. Does it have enough beds for everyone to sleep comfortably in? 2. Is there a kitchenette so we can prepare some of our own meals to save money? 3. Is there a pool for the kids to spend some time in? 4. Is there a complimentary breakfast? 5. Is it close to all the sights we want to see while we are in the area? 6. Does it provide transportation to and from the airport and to activities and events? If I can’t find a good deal on a hotel that can sleep our big family of 7, I start looking for Condos or Airbnb. I always find great deals at https://jifu.life. They have time share condos to rent when they are not being used! It’s amazing! Great checklist Annette, thank you! Hi Shannon from Grab My Passport, I find it interesting that your approach to booking accommodations is to book directly with hotels. What is your approach for finding the best deals when using direct hotel bookings? I do a lot of research into accommodations to make sure that where we stay is not only affordable but that it will provide everything we need as a family. Our two favorite online booking tools are Airbnb and Booking.com. I usually start with Airbnb to check out what’s available in the area and compare it to the pricing and locations of local hotels. Typically, I’ll check booking.com for prices and reviews and then I’ll head to the hotel’s direct website to check their price. Booking.com runs great specials sometimes that can’t be beaten, but I prefer to book directly with a hotel if possible, as it’s usually easier to make changes when you do so. Traveling with young children, accommodations are the most important part of our trip! Kris from Gadventures, I’m told you are an avid Airbnb user. Please share with us the lessons you’ve learned about using this booking website? Having little kids, I value the inclusions that you get from Airbnb such as a kitchen and laundry. It’s also the personal touches to a place that really make you feel you are at home away from Caution-home. Sometimes the owners fill the fridge with enough food for breakfast! Or I have seen welcome baskets of fruit too. Hosts are the best point of contact if you need to organise an airport transfer, or local ground transport too. Great pointers, thank you Kris! Hi Nikki from Yorkshire Wonders, please share with us what your #1 tip is for staying in a hotel with kids? Here are my tips for staying in a hotel with kids! The best arrangement are adjoining rooms. If you have older kids they have their own space, but more importantly, with younger kids you can maintain their bedtimes. You can settle them into bed and keep the room quiet, without having to sit in the dark yourself while they fall asleep! If you can’t afford adjoining rooms (and it does make it very expensive) then try and get a room with a balcony. Then at least you can sit with a book and a glass of wine on your balcony while the kids fall asleep! Welcome Yamy from Gofamgo, you seem to have a similar interested to us here at Mommy And Me Travels in that you like to stay in 4-5 star hotels. What are your secrets for finding great deals to this level of accommodations? Regina from Full Time Field Trip, you have a similar approach to Yamy on finding ways to save money on accommodations. Will you share with us your secret tips for saving money? 1. When planning, search incognito or use a search engine that focuses on privacy like DuckDuckGo. That way your searches, and thereby rates, are not stored in your cookies. 2. Take advantage of hotel reward programs. Credit card sign-up bonuses add up to huge savings. 3. Be flexible with your dates. You may get a better rate staying on a Sunday night, during the week, or a certain number of nights. 4. Only stay in hotels that offer free breakfast and have a mini fridge. Free breakfast means one-third of our food is free. Mini-Fridge means we can pack our own lunches and save money. And while it’s usually against the rules, I’ve been known to bring a crockpot on vacation to prepare dinners. Regina, I’ve never heard of that search engine. Thanks for sharing! Welcome Shannon from Captivating Compass! I’m told that you have an interesting approach to securing accommodations overseas. Will you share some insight on your process? Next, lets here from Deborah at World Wise Kid. Deborah before we started you shared that you love car camping. How do you manage car camping when traveling by air to a destination? Such a neat idea Deborah. Thanks for sharing! Sarah from State by State, as a full-time RV’er, most would think that you don’t have to research accommodations as you always have your place to stay with you. We know this isn’t factual as finding a place to park is just as important as finding a place to sleep. Please share with us how you decide on the accommodations for your RV? And last but certainly not least, welcome Melissa from Disabled Disney. I’d imagine that you have to do a lot of research to find accommodations that meet your needs. What are those top 3 items you look for when deciding on a place to stay? First, thank you to everyone who contributed today in our Choosing Family Accommodation series. These are amazing tips and I can’t wait to try out some of the new ideas I learned about. How about the readers out there? What new ideas did you learn? Do you know of any that you can share? Drop us a comment and let me know your thoughts! Enjoying this adventure with these family travel experts? Check out all the Planning A Family Vacation ideas on our dedicated page. Great tips!! there is some info on here I would never have known. Thanks for sharing! I love the Q&A style of this post! I love using Airbnb and Booking.com when traveling as well 🙂 Wonderful tips.